The 35th Dublin Scout Group was founded in 1928 so on 11th February 2018, they celebrated their 90th birthday, 90 years of bringing scouting to the parish and the surrounding area. The original scout troop was founded by Mr. Jack Giltrap, a former rover scout, who was invited by Fr. Val Burke, a curate in the parish, to start scouts in Donore Avenue. The first scouts met in Fr. Burke’s house opposite the church and shortly afterwards moved to the Little Flower Hall in Meath Street. The group had no permanent meeting place throughout the late 1940’s and 1950’s but met for a few years in a small hall at the back of the then National HQ at 71 St. Stephen’s Green. In 1961 the group moved to their present location on Arbutus Avenue, Parnell Road and, after various building projects, the den was officially opened in 1986. The group now consists of 5 sections (Beavers, Cubs, Scouts, Ventures and Rovers) and caters for 120 boys and girls from the area, led by a dedicated, enthusiastic and great group of young leaders. 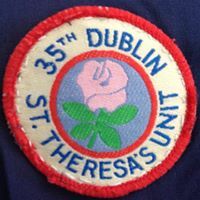 For more information on the 35th Dublin Scout Group, please see their Facebook page by clicking here. The 35th Dublin Scout Group held a very successful fundraising Strictly Come Dancing event in the Red Cow Hotel on Sunday 18th March 2018. For more information on the event, please see their 35th Strictly Facebook page by clicking here.